I can’t see all the playlists since the new update? It seems indeed that some users have this nasty experience. We are working on it to fix this as soon as possible. Sorry for the inconvenience! Why do I need to pay again for TuneIn when I already have this app installed? We have access to the database of TuneIn so we can offer you all those cool radio channels. But we need to pay TuneIn for this service per download, therefor we need to charge you. I bought Radio EQu for the iPhone do I need to pay for iPad? No, Radio EQu is a universal app. It works on iPhone and iPad without any extra charges. Just sync your phone and iPad. 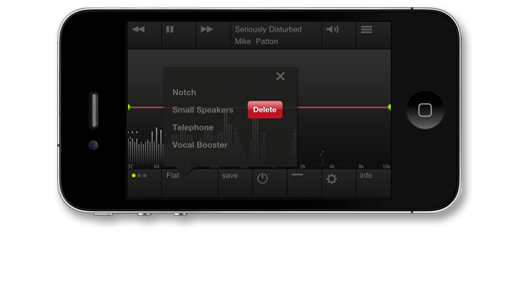 Radio EQu will have a native interface for both iPhone and iPad. Why can’t I play DRM protected music? Apple doesn’t allow third parties to access the data of DRM protected music. We are sorry but can’t help it! Just slide your finger over any preset from left to right. A delete button will appear. Why is the volume lower than the iPod Player? Radio EQu has 2 different modes for your volume: ‘Loud’ and ‘Save’. In Settings you can toggle between these two modes. In the ‘Save’ mode Radio EQu allows you to boost frequencies with as much as 12 dB, which can only be done by lowering the overall volume, to avoid clipping. However, if you want louder, you can always slide up the entire curve, and boost the total volume. The red clipping light will come on when the sound exceeds the dynamic range. In the ‘Loud’ mode the overall volume is higher but distortion can occur more easily. In that case you have to lower the total curve to avoid clipping. I can see only one song in an album? Radio EQu uses the tags from iTunes. If these tags are not 100% correct we can’t show you the right information. Go to iTunes and reorganize the tags. Why does Radio EQu skip some songs? If you purchased songs before April 2009 in iTunes they are protected by DRM. It means that third parties, like Radio EQu, are not allowed to access them. Legally we are not allowed, and technically it is not possible, to play those songs. The good news is that Apple stopped selling DRM protected music. I hear clicks playing music in Radio EQu? Radio EQu is using a lot of CPU and memory. If your device has not enough working memory or CPU power left Radio EQu just can’t do the trick. This can occur when other apps (that are still running in the background) or the iOS system have used up the memory, or continue to do CPU intensive tasks. Just reboot your device to clean up and Radio EQu will work as promised. If you have any comments, requests or bugs to report regarding Radio EQu, please contact us.